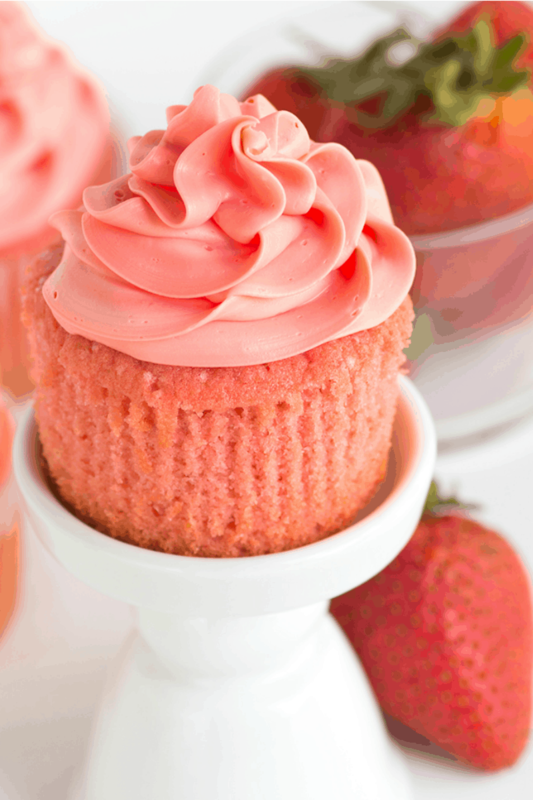 These Pink Strawberry Cupcakes are a sweet and pretty strawberry cupcakes recipe. 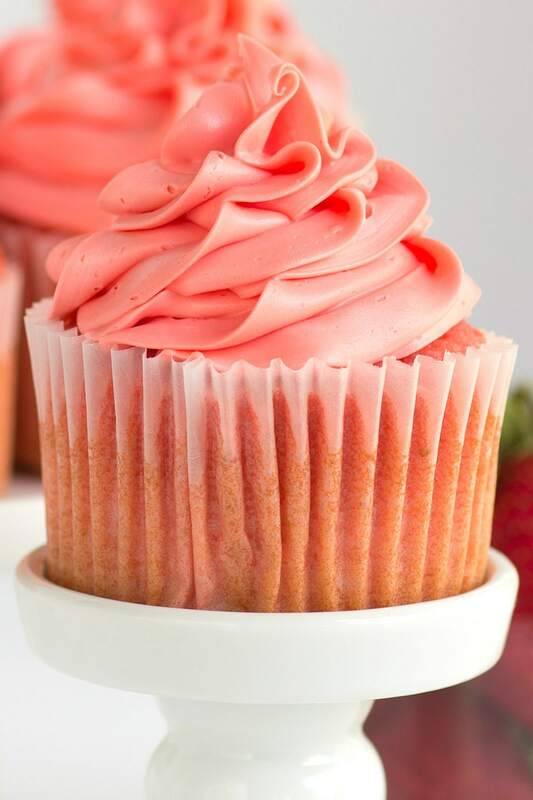 Utilizing fresh or frozen strawberries, this is a delicious strawberry cupcake recipe made from scratch. Watch the video showing you how to make this recipe, then scroll to the bottom of this post and print out the recipe so you can make them at home. 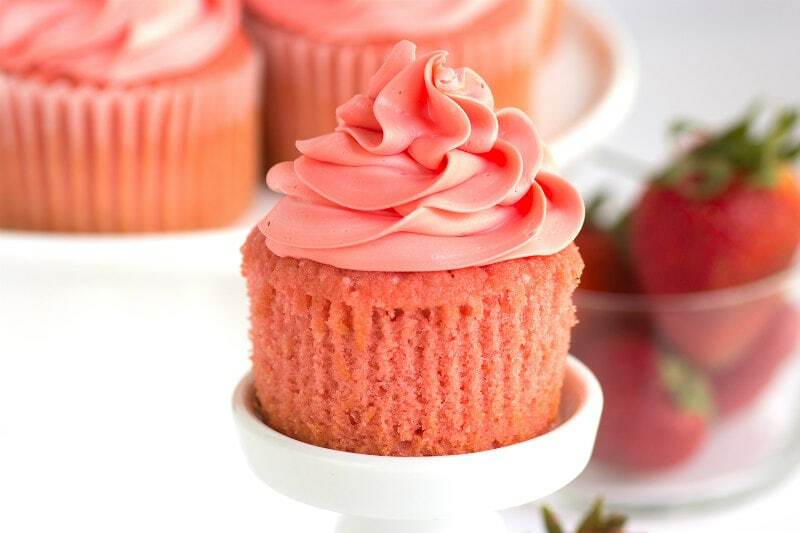 If you want to make strawberry cupcakes, you can certainly find a box of strawberry cake mix at the store and go with that. But the flavor of the boxed mix isn’t going to bring forth the delicious flavor of fresh strawberries. So how do you use fresh strawberries to make cupcakes? 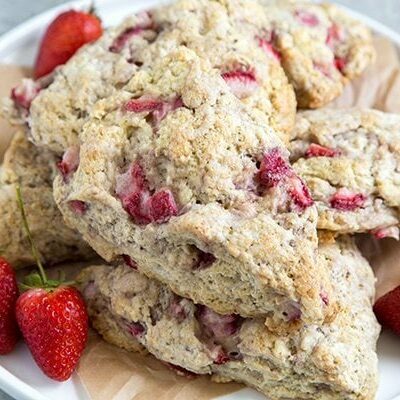 In this recipe, you’ll be using frozen strawberries that you will puree. If you have fresh strawberries on hand, you can pop them in the freezer until frozen and then puree them. Cake flour is used in this cupcake recipe to give it a nice, cakey texture. Fair warning: don’t taste the cupcake batter. It tastes like strawberry ice cream, and you may be tempted to grab a straw!! These cupcakes turn out to be a lovely shade of light pink, but I help that process along with a squirt of pink/red gel paste. 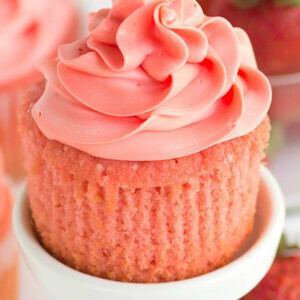 You can leave the coloring out and the cakes will be slightly pink, but they’re much cuter with a darker tint. 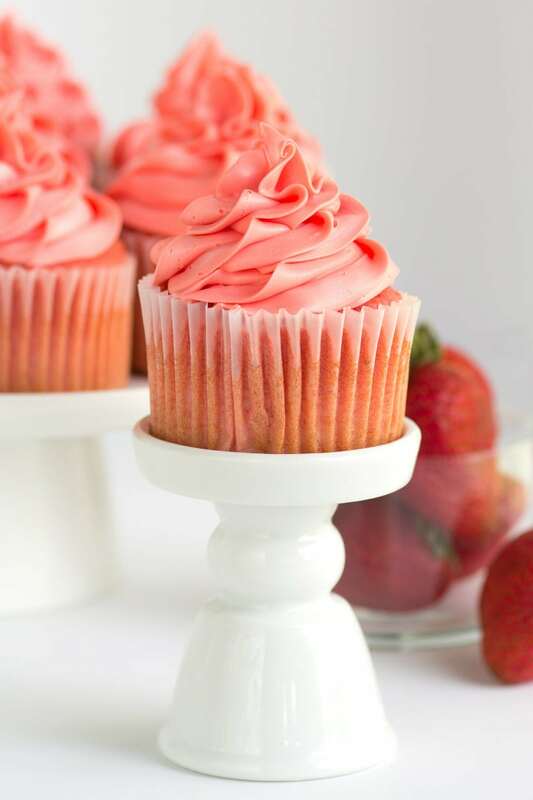 Pink Strawberry Cupcakes are a darling little dessert to serve at little girl’s birthday parties, baby showers and spring and summer celebrations. Everyone loves a good cupcake. And this is a good cupcake! 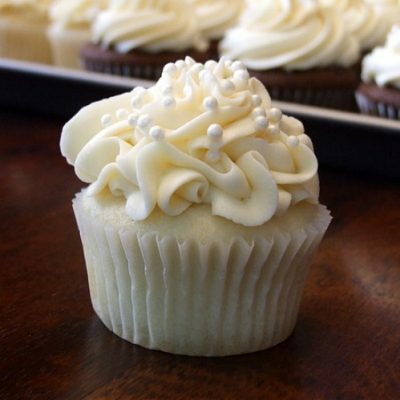 I frost these with my Wedding Cupcake Buttercream recipe- I highly recommend you try it! Just tint it with a little bit of red gel paste to get a nice pink hue. Thank you to Miranda from the CookieDoughAndOvenMitt.com blog for shooting beautiful photos of these cupcakes for me! Pretty pink cupcakes for special occasions! Preheat the oven to 350°F. Line 18 cupcake pan with paper liners. In a medium bowl, whisk together the flour, sugar, baking powder and salt; set aside. 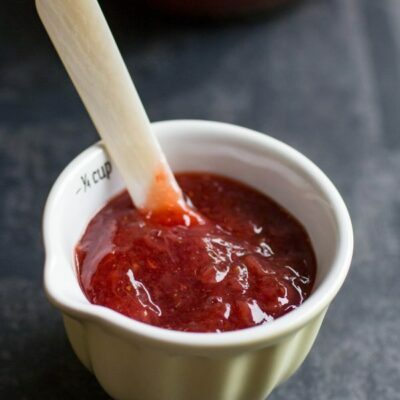 In a large bowl use an electric mixer to blend the butter with the strawberry puree. Add the flour mixture and blend until light and fluffy (the batter will be very thick). In another bowl, whisk together the egg whites, milk and dye. Add whites in three parts to the batter mixture, mixing only until incorporated after each addition. Fill the cupcake liners about 3/4 full. Bake 18 to 22 minutes, or until toothpick inserted in center comes out clean. 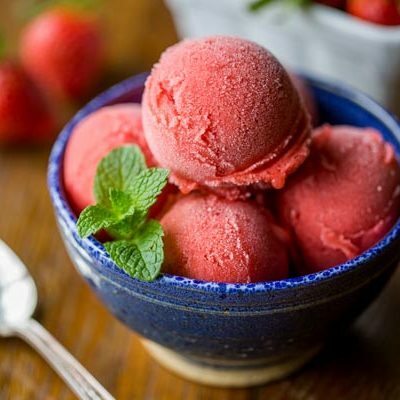 *Use fresh strawberries if you wish, but put them in the freezer first to draw the moisture out of them, and then puree them as you would bagged frozen strawberries. *I use Wedding Cupcake Buttercream tinted with pink gel paste to ice these cupcakes. 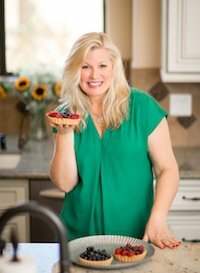 How do I make pureed frozen strawberries? 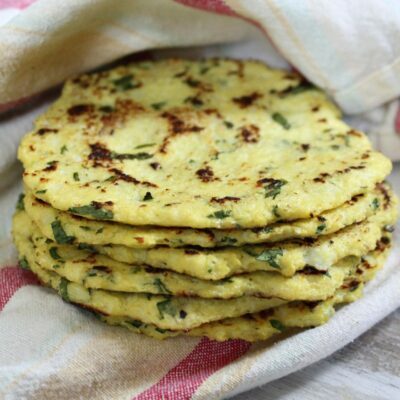 Put them into a food processor or blender, and process until they are pureed. Absolutely delicious!! My 3 kids loves it. And the wedding buttercream frosting, so divine!! Will definetly bake this again. What if we did not want to make cupcakes but an actual cake? How long does it go in the oven and does the amount of each ingredient change? Well, this recipe only makes 18 cupcakes. Typically, a cake batter that is good for cake is equivalent to a batter that would yield 24 cupcakes. I feel like you’d be short on batter if you try to make a cake out of this one. Can these be made a day in advance? I want to use fresh strawberries? 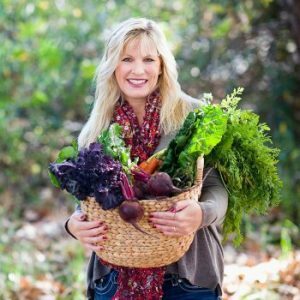 Should I use the same amount in my food processor as frozen? Use fresh strawberries if you wish, but put them in the freezer first to draw the moisture out of them, and then puree them as you would bagged frozen strawberries. Use 3/4 cup pureed. Do i use unsalted or salted butter? I like to use salted butter. One cup how many grams? Google tells me that 1 cup is 128 grams. Hi i would like to ask if i can use strawberry extract in exchange of the strawberry puree? If so, how many tblsp or tsp do i need to add? Thanks! ?? I haven’t tried using extract, so I’m not sure! I would follow the recipe just as instructed. I just tried this recipe and omg it was delicious. I made a cake with it and it made 2 nice size 8″ rounds. I accidentally used 2 sticks of butter instead of the 1 1/2 and you know what it was so good and moist but not to moist for a tier cake. It was perfect. I did not add the food coloring because I wanted it to be all natural. Also it was not to sweet. I had previously used a recipe that called for a box of strawberry jello and I was never really to happy with it because I felt it was to to sweet. I am my own worst critic about my cakes but I can honestly say this is the best and so natural tasting. I made these for my daughters 11th birthday. Perfectly sweet and a great crumb texture. Yet again, you have shared a wonderful recipe, many thanks!! Ok I made these as test for a communion this weekend because Ive made many cupcakes but never strawberry. I have to say the texture was amazing. I was a little concerned with mixing a cold ingredient into a batter because it goes against everything I’ve learned but I did and still can’t believe how wonderful they came out. I did end up using fresh strawberries because they are in season and plentiful and froze them for and hour or so to bring out the juices then puréed. Again these were so light and domed nicely and had the most amazing crumb. 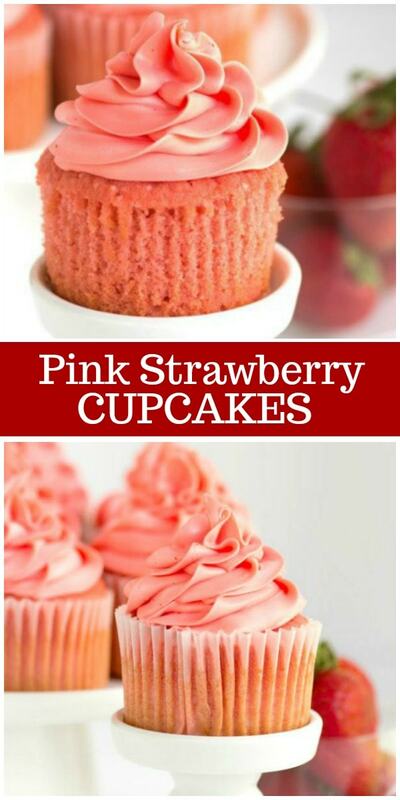 This will be my go to recipes for strawberry cupcake/cake for now on. Thank you for the wonderful recipe!!!! I need help. I just made these cupcakes for my daughter’s party tomorrow and wanted to taste one before I served them. They don’t taste like strawberry to me. 🙁 I followed the recipe to a T. Any thoughts? 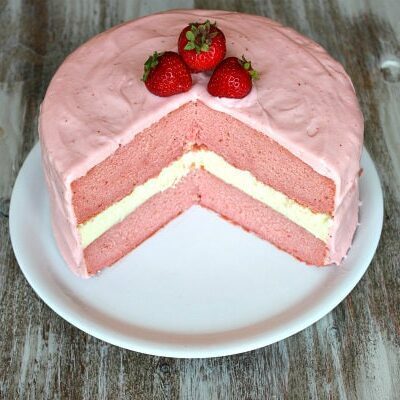 Should I have added more than 3/4 cup strawberry puree? The only thing I noticed while making them, which I thought possibly didn’t look right, was that the strawberry puree was more like strawberry ice. I kept pureeing the frozen strawberries, but it didn’t change the texture. I checked the cupcakes at 18 minutes, but they were still wet in the center so I kept them in for the full 22. Maybe they dried out at the last minute? Any thoughts/help would be greatly appreciated! !